Today's post is a special recipe. It's a payasam that Amma makes for Ugadi and only this year I came to know the reason behind it. Somehow she had never disclosed until this time, that this was a dish her Mom used to prepare. As always, there is that tilt I can hear in Amma's voice when she talks about her mom. Though we don't talk about it, it's been nearly five months since she passed away, we still converse as if she is with us still. So hearing about how she made it, really made it very special. I was determined that I record as how Amma was taught this to be made. I am not sure however much I record this with clarity if I will be able to get that same texture as I could see in the picture. 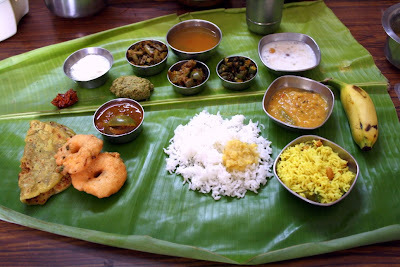 But still the day was special for me with Amma sharing the tradition behind each dish. Her mom always only makes this combination for the Ugadi pooja and never on the regular days. I could imagine how important this was to her. I hope I have done justice in writing it as intended. 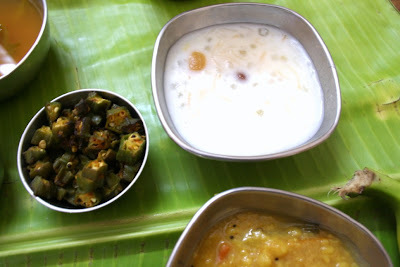 I especially sat with Amma and took notes to recreate it again in my Kitchen. Heat a small pan with ghee, roast the nuts and raisins. Keep it aside. Soak the sago for 30 mins. Then boil the sago in 3 cups water. If you are going to pressure cook, then use1 & 1/2 cups water for 2 whistles. Meanwhile roast the semiya in ghee and keep it aside. Also have the milk boiled and ready. Once the pressure falls off, pour the milk into the sago, when it starts to boil, add the semiya. Cook for couple of mins. Then add sugar and continue cooking. Finally garnish with cashew nuts and raisins. The entire cooking has to be done in low flame. Total cooking time will be 20 mins in pressure cooker.